Soup is a great option for a quick, one-pot meal. Better yet, you can tailor homemade soup to be healthy and affordable. Make a big batch and freeze the leftovers as part of your meal plan. But why settle for basic chicken noodle or tomato soup? Amp up your soup and make it the star of the dinner table with a few simple tweaks to a basic recipe. Try one of the following one-pot soup recipes you can make in about 30 minutes with the help of a Dutch oven or pressure cooker. 1. Pressure Cooker Soup. The Quick Cooker Red Lentil & Spinach Soup will become your new weeknight favorite because it comes together fast and has plenty of healthy ingredients. The red lentils have a subtle flavor that complements the cumin, coconut, and lime in this soup. Plus, it’s very filling! 2. Savory Chicken Soup. Turn the family classic chicken pot pie into a soup on the stovetop. Chicken Pot Pie Chowder is creamy, hearty, and satisfying. To save prep and cooking time, use frozen vegetables. 3. Healthy Stew With Kale. Kale is one of the most nutrient-dense foods you can eat. It’s packed with vitamin C, iron, fiber, calcium, and antioxidants. And it’s a tasty addition to a vegetable or bean soup. 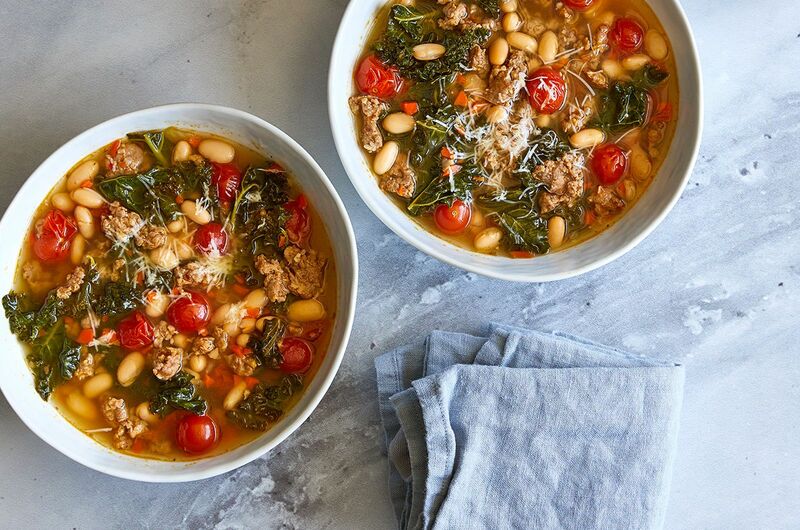 White Bean, Kale & Sausage Stew adds fiber-rich beans and spicy sausage for extra zing. 4. Romesco Soup. Romesco is a traditional almond and red pepper sauce also known as Spanish ketchup. Use this base for a quick Romesco Soup. Our recipe hack calls for a jar of roasted red peppers, a can of tomato sauce, and almond milk for added creaminess. 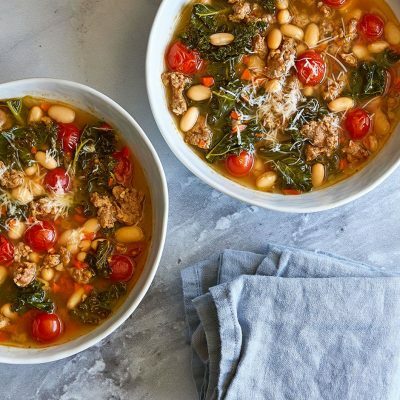 Make this soup into a meal by adding couscous and fresh spinach. 5. Soup in the Slow Cooker. Chicken Pho is a hearty Vietnamese soup made with broth, rice noodles, herbs, and meat. Traditional pho takes more than a day to make, but this soup recipe takes 10 minutes to prep and four hours in the slow cooker on HIGH. Pro tip: Start this soup on your stovetop and finish it in the slow cooker using a Dutch oven set. 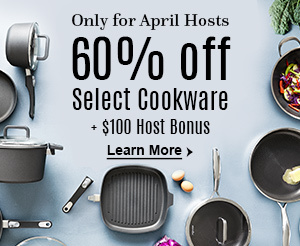 Use the LOW setting for eight hours so dinner’s ready when you get home from work or running errands. This article has been updated since it was originally posted in October 2017. Which soup recipe will you try? Tell us how you’d customize these recipes and make them your own. These are in my top 10 soups. All look amazing! Thanks for sharing. I’m very impressed with the flavor of the Pho. So delicious.